In this new TORn Library piece, our newest feature writer Gibbelins examines the difference between skill and knowledge and whether the former has an unjustly sullied reputation in Middle-earth as a result of the rash and self-seeking acts of craftsmen such as Saruman and Fëanor. The concepts I wish to discuss are best expressed with the Quenya roots ‘curu-‘ and ‘nolo-‘, but I will try not to subject you to the Elvish for the entire essay. Both of these roots have at times been translated as ‘wisdom’, and yet they represent different sides of wisdom and different inclinations. I’ll use the English glosses ‘skill’ and ‘knowledge’ as reasonable approximations. The contrast between the two ideas is, I think, fundamental to Tolkien’s understanding of how to live righteously. To highlight the contrast, I will invoke two pairs of characters from the legendarium: Fëanor and Fingolfin; Saruman and Gandalf. If you don’t believe that these characters effectively embody these ideas, look to their names. The original Quenya father-names of Fëanor and Fingolfin are literally Curufinwe and Nolofinwe, respectively. 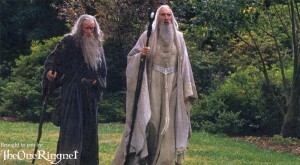 Saruman’s Elvish name is Curunir. Unfortunately for my purposes, none of Gandalf’s many names seem to contain ‘nolo’, but I hope you will accept that he is a natural counterpoint to Saruman and a fit representation of ‘knowledge’. Knowing the deeds of these two sets of characters, you may already be leaping to conclusions about which type of wisdom Tolkien valued more. Certainly it would be difficult to argue that Fëanor and Saruman accomplished more good with their skills than Fingolfin and Gandalf did with their knowledge. But I hope we can refrain from being so quick to deal out judgment. The ‘skill’ to which I refer is that of craftsmanship and inventiveness, including the creation of magical devices or methods. In Tolkien’s world, there seems to be something particularly noble about the impulse to create new things. 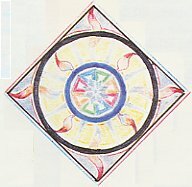 Speaking on his own desire to create fantasy worlds, Tolkien once said that the act of “sub-creation” “remains a human right: we make in our measure and in our derivative mode, because we are made: and not only made, but made in the image and likeness of a Maker” (Fairy Stories, 9). Yet if the history of Middle-earth is any indication, that kind of skill would seem to be dangerous. A craftsman may come to “love too well the work of his own hands”, to the point of being jealously possessive of it, like Fëanor. Or, like Saruman, he may come to love progress for its own sake and believe that the world can be improved by ordering all things to his design. Metalwork may be turned to the forging of swords; mastery of fire may be turned to make explosives. 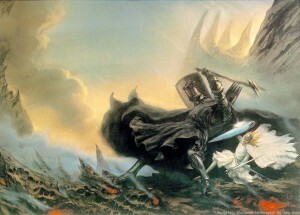 Knowledge, like that exemplified by Fingolfin and Gandalf, poses fewer threats. The seeker of knowledge and lore endangers neither his own soul nor the safety of the people around him. A follower of this path seeks to understand nature, rather than mastering it and turning it to his will. He does not “break open a thing to see how it works”, the folly which Gandalf would say “has left the path of wisdom”. But while knowledge and lore may help to protect fair things, or preserve the memory of things once fair, they do not give birth to new things of beauty. I can never shake the feeling that seeking knowledge cannot really be as important or noble as cultivating skill; there is a reason why Fëanor was originally held in such high esteem amongst the Noldor. Even Aulë the Maker once stumbled and over-stepped the bounds of sub-creation when he tried to create the Dwarves. But Aulë’s presumption was not punished and condemned by Iluvater; rather it was rewarded by making his vision a reality and thus enriching the history of Middle-earth in unexpected ways. “Gandalf as Ring-Lord would have been far worse than Sauron. He would have remained ‘righteous’, but only self-righteous. He would have continued to rule and order things for ‘good’… Thus while Sauron multiplied evil, he left ‘good’ clearly distinguishable from it. Gandalf would have made good detestable and seem evil.” (Letters, 333). Is this what Fëanor and Saruman have done to the notion of skill and craft? Though their first impulse to create was good, by their wicked deeds they have made it seem evil. By making the act of sub-creation indistinguishable from evil, they have done more damage than if they merely sought to destroy. To create shall always be perilous, I suppose. Even the purest of heart can never be certain how their work will be used when it passes into the larger world. Tolkien knew this as well as anyone. But I do not believe he ever meant to suggest that the creative impulse was wicked in itself. The perils of skill and craft shall ever be balanced by their capacity to bring new beauty into the world. Gibbelins is a librarian with a degree in linguistics and an abiding love for Tolkien. You can read more of Gibbelins’ features over on the io9 observation deck.